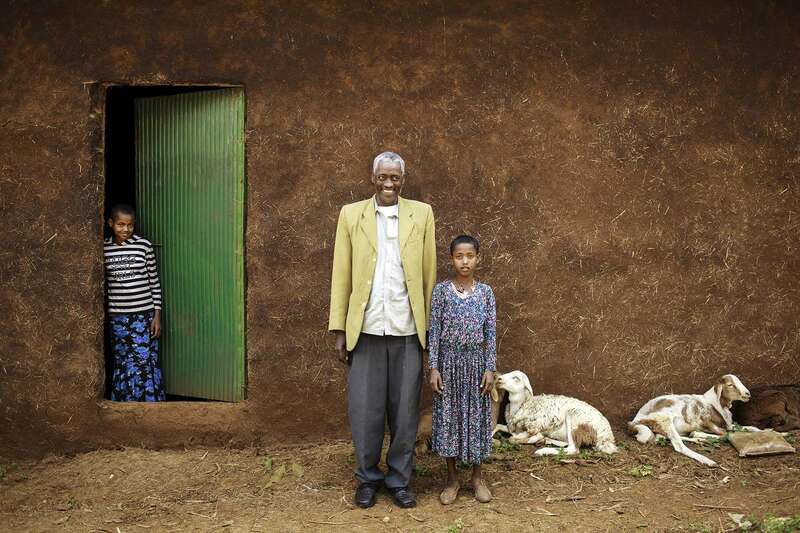 Negbaru Meheret, 42, poses for a photo with his daughters and newly-built warehouse in Womburma Village in Amhara region of Ethiopia January 21, 2011. He is a member Shindi Primary Cooperative. He used to sell his harvest at lower price, but now the cooperative pays the best price, and he has managed to earn enough money to build a new warehouse to store his harvest so he can sell it when the price is high. The cooperative participates in Purchase for Progress (P4P) by WFP. P4P in Ethiopia focuses on developing markets and helping farmers' cooperative members to produce more and market their crops so that they can engage more profitably and sustainably in markets.